The actor combined battle ropes and medicine ball work with Tabata and CrossFit-style workouts to strengthen and condition his entire body. Get the new May 2017 issue of Men's Fitness starring Chris Pratt, available for download at the iTunes store, and now available on newsstands. Chris Pratt has definitely put himself through the wringer to ready himself for his roles: He jettisoned 30 lbs to play an MLB catcher in Moneyball, banged out 500 pushups a day to get in Navy SEAL shape for Zero Dark Thirty, and dropped 60 lbs to nail the human/alien hybrid look in Guardians of the Galaxy. What Parks and Rec fan would have suspected Andy Dwyer was packing a six-pack under that spare tire? Since wrapping Guardians Vol. 2, which opens this month, Pratt's been "mixing it up"with his workouts, trading weights for "more straight conditioning, like high-intensity interval training and CrossFit-style moves" to get in what he considers "the hardest workouts." He currently trains seven days a week, adding battle ropes and medicine ball work with CrossFit and Tabata HIIT. 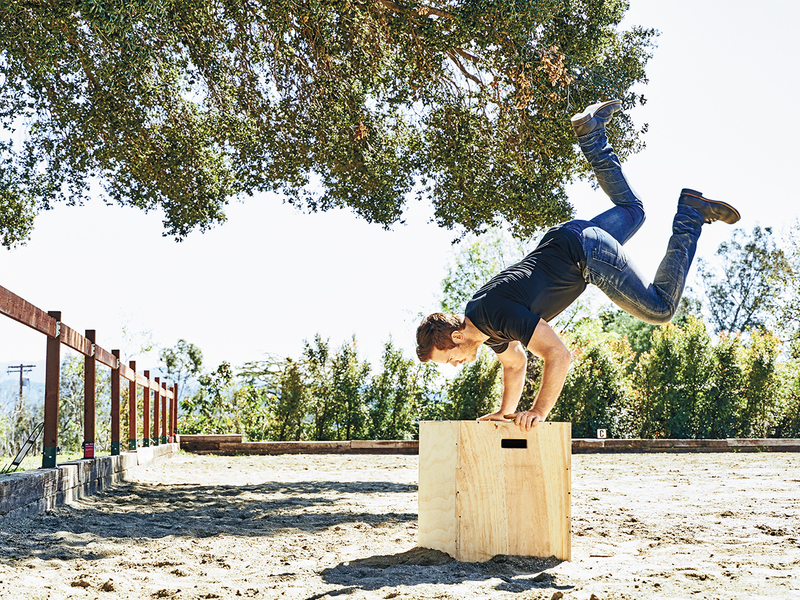 The 37-year-old actor, who's also currently training to complete a triathlon, says that a concentration on strength, condition, and flexibility—including sessions of vinyasa hot yoga—work well for him: "I try to balance those three things and figure out which I have the biggest deficit in, then put the work in there," he explains. This workout that follows is a routine Pratt would cycle through during his training. Get the new May 2017 issue of Men's Fitness starring Chris Pratt, available for download on Friday, April 21, and on newsstands Monday, April 24.